Snowmobiles approaching the village of Kotlik for a winter dance festival. Join us as we also explore and celebrate the Yup'ik cycle of seasons. 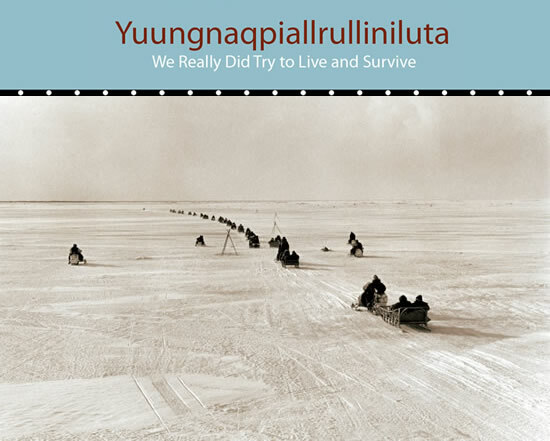 Tauna tua-i yuungaqpiallerput nall'arusngaqapiartuq atrukuni. Yuungnaqpiallrulliniluta. That yuungnaqpiallerput is perfect as a title for this exhibit. We really did try to live and survive the real way. Yuungnaqpiallerput includes us, too. In villages, people still use those ways, even though they may be using different materials. We're not distancing ourselves from our ancestors. This exhibit teaches about the Yup'ik way of life--the animals and plants, the tools used to survive, and the values. It also teaches about the generosity of men and women who shared their knowledge. St. Marys elders examine objects at the 1989 Mountain Village Dance Festival. This exhibit will show the proven ways of tools and processes Yup'ik people used to survive and let people see the common ways we share the knowledge of our environment. Long ago our beliefs and our way of life weren't seen as separate things. But nowadays, they look at those two as separate. In this exhibit we should try to help people understand that their ways of life and their beliefs were one. This exhibit is built on a decade of collaboration between Yup'ik elders and educators working in museum collections. 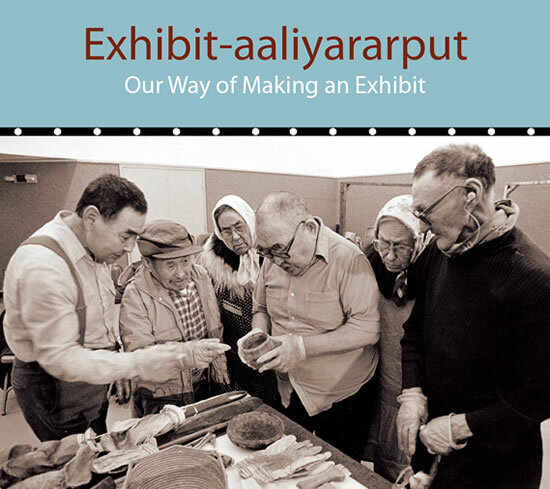 To realize their wish that their younger generation see what they were seeing, they began meeting in 2003 to plan this exhibit to show how Yup'ik tools and technology were grounded in both spiritual values and scientific principles. Yupiit augkut qaqimallruyaaqelliniut ciuqliput. Ca cuqingasterluni. Ca nallunritesterluni. Tamaa-i tamakut cuqingailriit cat nalluvkenaki, callrit-llu nalluvkenaki. Scientist-aullrulliniameng augkut ciuliaput. Our Yup'ik ancestors apparently were complete with everything needed to keep the culture alive. They had experts who could measure and understand happenings in their daily lives. Our ancestors apparently were scientists. Yup'ik men and women learned to construct and work with tools through constant trial and error. They knew their materials well and displayed great inventiveness in using them. Yup'ik technology can demonstrate scientific principles in new and exciting ways by matching these practical outcomes to the problems they were designed to solve. Looking at Yup'ik tools will help people understand science and how it is part of everyday life.